With all the new data at your fingertips, it can be daunting to pick a place to begin. We recommend starting with sales data because it can tell you a lot about the overall health of the company. That being said, your sales organization is probably comfortable with the reporting they can access on their own, in the tool they know and love: Salesforce. So as you start diving into the data and providing recommendations, work to gain the trust of the sales organization. It can be tricky, but by following a few guidelines, you can build up the credibility of your sales data analyses. 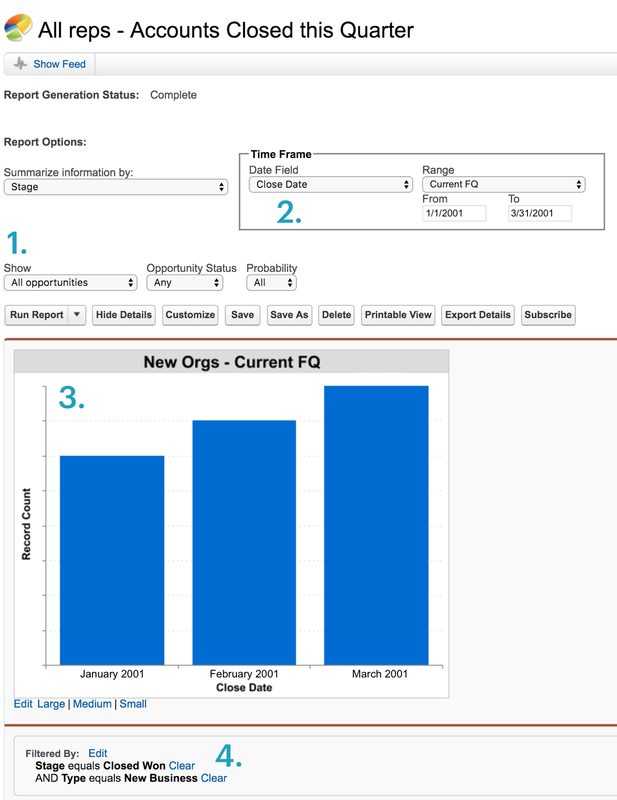 Bonus: Learn how to recreate Salesforce reports with SQL (and why it's important). Download Understanding Salesforce CRM Data: A Complete Guide for Analysts. To understand sales data, you need to understand your sales organization, specifically how they operate and what their goals are. The best way to do this is to—wait for it—talk to them. What metrics matter most to you? Could you walk me through how a lead flows through the system? What are the key funnel stages? What are key buying signals? What distinguishes a good lead from a bad lead? What are your goals for the sales organization? Sales development representatives (SDRs) reach out to potential customers and determine if they're a good match for the product or service. SDRs aren't focused on closing business; they're focused on bringing new leads into the pipeline. Typically, their goals are based on the number of leads they pass over to the account executives. Account executives (AEs) are responsible for closing deals. Typically, their goals are based on how much new business they close—the number of companies and the amount of money. Account managers (AMs) manage relationships with current customers. Typically, their goals are based on how many customers renew their contracts and for how much. Get to know these members of your sales organization and understand what makes them tick. For instance, SDRs might want to know which business verticals generate more qualified leads. AMs might want to know how often they should check in on current customers to increase the chance of renewal. You won't know unless you ask. What parts of your workflow feel like a waste of time? What are the blindspots in your sales process? How are your goals determined? What happens if you don't reach your goals? What happens if you do? How it builds credibility: By getting to know salespeople, you'll be able to choose projects that will help them reach their goals and eliminate pain points. They'll appreciate these wins—no matter how small—and be more likely to value and trust your work. Before you start an analysis, it's always a good idea to understand where the data came from. Chances are, a customer relationship management (CRM) tool is the source of the sales data you're working with. The CRM is where the sales organization records details on current and potential customers. When a sales rep reaches out to a lead, she'll log information about the call—the date and time, who the call was with, and what was discussed—in the CRM. The sales organization also records some information via automation. For instance, Salesforce has an integration that automatically logs reps' emails. Maintaining strict records allows the sales organization to reference the complete history of interactions with a client. They use this information to figure out how to best approach reaching out to a lead or closing a deal. CRM tools manage this information in similar ways. For instance, in both Salesforce and Microsoft Dynamics CRM, buyers (usually companies) are classified as accounts, and potential deals are classified as opportunities. These records are known as “objects” in Salesforce, but in Microsoft Dynamics CRM, they're known as “entities”. Ask the head of sales, or a sales operations person, if you can poke around in your CRM. Often, CRM licenses are expensive, but there's probably an account they can help you access. Ask a sales rep to walk you through how they enter different types of information in the CRM. For instance, how is creating a new account different from creating a new opportunity? Once you're familiar with the CRM, it'll be easier to understand the data you're seeing in the warehouse. Sales data often directly reflects how the information was recorded. For instance, if a sales rep entered information about an opportunity, that data will likely be stored in an opportunities table. How it builds credibility: You're less likely to make mistakes if you have a thorough understanding of your CRM. It's crucial to avoid errors early on. Even if your later work is error-free, your colleagues will remember your initial mistakes and question your recommendations. But if you consistently produce accurate analyses out of the gate, later errors are more likely to be forgiven. When you present your first analyses of raw CRM data, you might meet resistance from sales leaders, simply because they're not used to seeing sales numbers outside of the CRM. It's where they go every day to see how their team is doing. Why should they place trust in your analysis? To ease these concerns, create exact copies of their favorite CRM reports. If your numbers match what the sales organization sees, they'll be more likely to trust your work—and you'll need that trust as you begin asking complex questions that the CRM's reporting just can't answer. Luckily, re-creating CRM reports in SQL is relatively straightforward. Many CRM reports have filters that match neatly to the SQL queries you'll need to write. These definitions act as guides and answers for you to check your work. Take this Salesforce report, for example. What's this report telling us? From the Report Options(1), you can see that this report shows opportunities at any stage and with any probability of closing. That means you need to call on the opportunities table. The Time Frame box(2) restricts the date range to the current quarter. WHERE and DATE_TRUNC accomplish this in SQL. The chart(3) shows how the records are aggregated. You’re looking at the count of records by the month of the close date. To show the times units as months, use DATE_TRUNC, and to aggregate the opportunities, use COUNT. Finally, the Filtered By section (4) indicates that you’re looking at opportunities where the stage is Closed Won **and the type is **New Business. Simply add these conditions to the WHERE clause. And voila! You should have the exact same report in SQL. All this isn’t to say that you should wage a war on CRM reporting. Some people will continue to use the CRM for most of their reporting needs. After all, the most valuable reports are likely those the sales organization has already built in the CRM. That's fine, as long as they trust the analysis you've done outside of it. How it builds credibility: Unfamiliarity breeds wariness. By replicating CRM reports in SQL, you're giving the sales organization something familiar to latch onto. It's a great first step towards helping them become comfortable with the analysis, as well as the recommendations you'll provide. Ready to analyze some CRM data? If your company's CRM of choice is Salesforce, check out this free eBook for more tips and pre-written SQL queries. Download Understanding Salesforce CRM Data: A Complete Guide for Analysts. This post originally appeared on The Data Point.